HARRISON, N.J.—Nestled along the Passaic River, this town has never quite shed its gritty industrial image, even as residential development helped transform nearby Jersey City and Hoboken from faded urban centers into commuter havens. A recent announcement of $256 million in funding to replace the town’s 76-year-old PATH station, which isn’t even currently wheelchair accessible, could help change that. A half dozen developers are planning to break ground on more than 1,000 new units, primarily rentals, in Harrison by the end of the year. The construction is part of an even more ambitious idea: to add 13,000 units over the next decade to a town that has just 13,000 residents now. And it’s a gamble. That’s about as many new rental units as are slated to sprout in Brooklyn in the coming years. But if it’s successful, the building boom may help reverse Harrison’s downward course. “What was the alternative? Have the town die?” Mayor Raymond McDonough said. 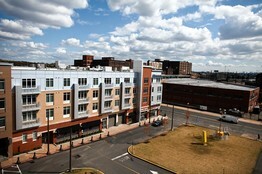 Harrison’s redevelopment in many ways reflects a continuing reversal in the state’s fortunes. As single-family homes in leafy suburban towns languish, cities are experiencing a bit of a revival because of their proximity to public transportation. “This doesn’t mean the suburbs are going to disappear, but it really makes sense for people who are close to New York,” said Stuart Meck, an associate research professor at the Edward J. Bloustein School of Planning and Public Policy. 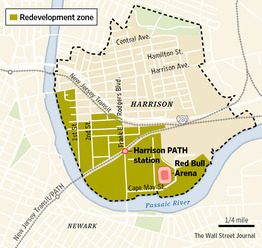 In the mid-twentieth century tens of thousands of employees streamed into Harrison’s industrial zone each day, home to companies like RCA electronics and Otis Elevator Co.
About 15 years ago, the city created a plan for developing the 250-acre former industrial section of Harrison into a primarily residential community. But the plan hit a series of obstacles, including the Sept. 11, 2001, attacks and collapse of Lehman Brothers Holdings Inc., when the flow of commuters to downtown Manhattan dropped. Private investors have spent or committed more than $650 million toward the redevelopment effort, and $286 million of public funds have been committed to the redevelopment from different levels of government. Harrison still faces significant hurdles: The developers will have to create retail and green space, where there is currently almost none, and the new developments are isolated from the already limited downtown core. But the success of one of the area’s recent rental developments has given other developers the confidence to move forward. Harrison Station—a 275-unit rental building built by Ironstate Development and Pegasus Group on remediated brown fields—began leasing in September and is fully rented. Among the building’s attractions are a swimming pool and beach volleyball court. But its primary selling point was more likely cheap rents—$1,750 a month for a one-bedroom—and generous incentives. Sarah Lin, a 33-year-old who works at World Financial Center, moved into the building a few weeks ago. She and her husband were living in a studio apartment on the Upper West Side, but Ms. Lin, who is pregnant, said they needed more space. Ms. Lin said the landlord offered two months of free rent when they signed the contract, which helped seal the deal. The same partnership plans to break ground this spring on a 138-room Element by Westin hotel, as well as a second apartment building. Advance Realty is building a project, Riverbend District, which will eventually include more than 500,000 square feet of retail space. The developer plans to break ground this fall on the first phase, which will consist of 300 units, but no initial retail component. Developers say they will compete in part because rents will be about 30% lower than Jersey City and Hoboken. “I don’t think you can get a one-bedroom for $2,000” in those places, said Jeff Milanaik, president of Heller Industrial Parks Inc., which is building a multiphase development consisting of 750 residential units that will break ground early next year. Developers say they plan to put in more than half-a-million-square-feet of retail space over time and several acres of parks. The mayor said the money will be up to the private sector and the developers say they plan to seek state grants for the creation of green space. Krystal Mitchell, 25, is a bartender at the Green Room, a favorite watering hole three blocks from the PATH station. She moved to Harrison with her family five years ago but said it needs basic amenities such as a cafe with wireless Internet. What the city doesn’t need is more bars, Ms. Mitchell said. “You can drink or get a tattoo,” she said.